the river levels rise! Unfortunately we've had a little too much rain recently and most of the rivers are a little too high. And with only a couple days off this week with a bunch of other stuff to take care off I wasn't interested in doing a full day of big water paddling and lots of driving. So I rounded up a couple other locals and we headed to the lower American river right here in town. It's dam controlled but they've been releasing huge amounts to make room in the lakes above for the huge amounts of rain water coming in to them. Normally the lower runs between 1,000 and 5,000 cfs throughout the year. Today it was at 21,000 cfs (we just missed 31,000 by a couple days...). We took our sea kayaks since this isn't really a whitewater river. Normally it's fairly flat with a couple class I rapids. Today there were several nice class II waves and lots of swirly water. The only problem is that with the water moving so swiftly there was little opportunity to get back to any of the fun waves once you washed off. But it still made for a fun and quick trip and it's always interesting to see rivers at different levels. Here are a few more pictures from the day. OK, in California there is no real off season. We can (and do) paddle year round. But the pace does slow down in the winter and is more dependent upon the storms that come through. Early Fall is great weather on the coast and early Spring is when the rivers start running so I paddle the least November through January. I like to take that time to get some rest and recover from the previous year's adventures and to do some training to help prepare for the following year's opportunities. So I thought I would share a little of my training philosophy on what it takes to be 'in shape' for paddling. The first thing you need in any training program is a goal. It doesn't have to be very specific but you need to know what you are trying to accomplish. Are you trying to get faster? go further? recover from an injury? Are you preparing for an expedition? long hikes in? a local race? Or do you just want to be able to paddle more often without getting tired or injured? With a goal in mind you can customize your training to achieve that goal most efficiently. Fitness is different than strength, endurance different than power, injury prevention different than health. Personally, I do a wide variety of paddling and need a bit of everything. But I tend to focus my off season training on building strength (mainly endurance) and fitness (cardio). Strength training can be done with weights in the gym or with simple exercises and equipment at home. For kayaking there are some obvious areas to work on: shoulders, core, back - and some not so obvious: chest and legs. It's very important to strengthen the muscles you don't use when paddling. This prevents your body from getting unbalanced - the muscles you build up when paddling will be much stronger than others and this will ultimately lead more stress on the weaker muscles. I also focus on endurance training vs. power lifting: I go with high reps and push muscles to exhaustion. Unless you are a sprint paddler you don't really need to bulk up - it's more about making the muscle mass you have more durable. And while strength training does help with injury prevention (or recovery) I think the best thing for that is stretching. Flexibility is key to allowing your body to use proper technique and to absorb forces when out of position. During the paddling season I don't have the energy to do separate strength training so I focus mostly on stretching - yoga is probably the best thing you can do to stay healthy and paddling. The older you get the more important this becomes. The other training I do is cardio. I have bad knees so I don't run; I hate biking in the cold and rain; so my cardio is generally done in a boat. Anything that gets your heart rate up for a steady period of time will work. And if the focus is endurance you need at least 30 minutes of hard paddling to get any benefit. An hour or two is even better. Works great for both whitewater and sea kayaking. But I will also get in my polo kayak and do some sprinting and interval training. I find this really helps for situations where I have to push all out for a matter of seconds - must make ferries or fighting a tide race. And the overall key to any training program: consistency. Your body improves when it is subject to repetitive stresses with time in between to recover. If you have too much time between the stress sessions then your body reverts back to what it was. It needs routine workouts and each time you need to push a little harder - an extra rep, a slightly longer distance or shorter time - to make your body improve. Even small efforts of 30 minutes twice a week will show improvements, but if you skip a week or ten days then you will lose the gains you have just made. So if you can't get out there and paddle at least get ready for when you can. If you are out there paddling, use the opportunity to prepare for even more paddling when the weather turns and the options abound. How important is boat fit? 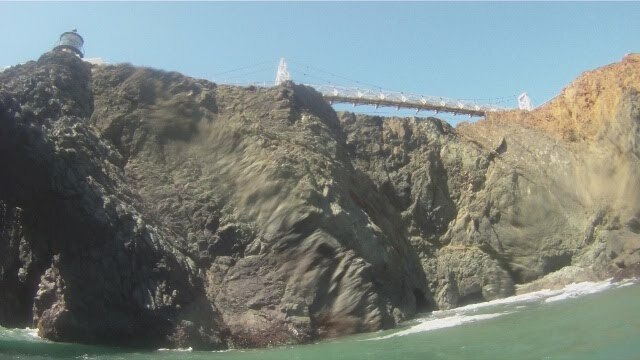 We met under the north tower of the Golden Gate Bridge to do some playing amongst the rocks around the Marin headlands. There were four of us and four different boats with a plan to switch throughout the day to see who liked what the best. There was a steady rain but little wind and even though our timing was a little off from the current we had no problem getting out the Gate. And immediately we were met with surge- even inside the protection of Pt. Bonita the forecasted 10 ft., 13 second swells were creating some fun action. We played our way out to Pt. Diablo and landed on a steep little beach for the first boat swap. The swap put me into the new P&H Delphin - a boat I'd been wanting to try for a while. It was the longest boat we had with us at 15'5" and was designed with rock gardens in mind. My skirt was rather large for the boat and I mentioned to Sean I would just have to avoid getting dumped on by a wave (see the 2:35 mark in the video to see how I jinxed myself). Sean ended up in a boat that didn't fit so well and as we pulled away from the beach he mentioned that he didn't think he would be able to stay in it if a wave took him for a ride. In no time we rounded Pt. Bonita and I followed Sean in amongst the rocks, close to the point, and faster than you can say double jinx a big set came in and washed over our protective rocks. Sean and I both turned into the broken wave and drove forward. My long boat with a pointy and buoyant bow pierced the wave and I rode over the top. I looked to my right and saw a complete lack of Sean and his rounded bow little boat. I looked back and saw the wave wildly throwing the boat around and Sean popping up next to it - he had been sucked out of the boat. I looked back outside in time to see an even bigger wave coming in and charged forward yet again - this time launching my boat completely into the air as I topped the wave. I paddled towards Sean who was swimming away from the rocks (and his boat) and he told me to get clear - even while swimming he was looking out for my welfare. He swam around the point into calmer waters and the rest of us met him there. He climbed onto my back deck and with a little help from Bill and Tony we headed to the nearest beach. Once there Sean climbed ashore while we went back to see if we could salvage the boat. But the boat was nowhere in site - either trapped in the rocks or at the bottom somewhere. Without a boat Sean walked the three miles back to the vehicles while we paddled. He beat us back and we were all in relatively good spirits (Sean just felt terrible about losing someone else's boat). While losing a boat is never fun it was also never too scary. Sean was comfortable with the swim and was not in much danger. If he had been in a boat that had a proper cockpit that was outfitted for him he would have been able to stay in the boat, roll up after the wave passed and paddled out of the impact zone. With just three paddlers at this point we chose to stick together getting the swimmer safely to shore. If we left someone to watch the boat it would have left one boater alone somewhere. It was easy enough to get him to shore and he had quick access to the road which lead back to our launch site. The boat had float bags backing up the bulkheads and hatches so we were expecting it would still be floating when we got back to it. So I think our response was correct and losing a boat isn't such a bad thing in the realm of possible outcomes. Prevention was the key and proper boat fit was the lacking element. Lesson learned. 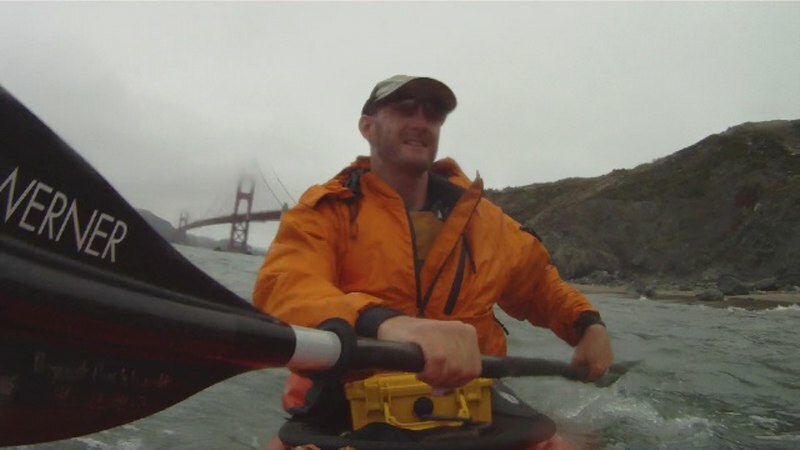 Sean's recounting of events is on the California Canoe & Kayak staff blog. Video below - you definitely want to watch this in full screen HD. Having belonged to several paddling clubs over the years and paddled with many more, one issue that continually recurs is the reluctance of most paddlers to ‘lead’ a paddle. Plenty of people want to go on paddle outings that someone else initiates but the thought of taking on that responsibility themselves sends many competent kayakers running for the hills. And not just for club paddles – I’ve seen many groups of friends out for an afternoon paddle break down into disorganization, quarrels and worse. The role of a leader is often a necessary one but most people don’t realize how easy it can be and how little work it actually requires. Let me draw a distinction here between leading a trip for a club or group versus leading people in a professional capacity. If you’re getting paid to lead a trip you have additional responsibilities, both technical and legal. And you will need advanced training (first aid, group management, etc.) to properly carry out your duties. But while a club paddle may have a ‘leader’ (or ‘host’ or ‘initiator’ or other similar term) who organizes the paddle it is still considered a joint adventure – everyone ultimately shares the responsibility on the trip. And it is important that everyone understands that so if you are the organizer make sure people are aware of their responsibilities as well as your own. Quite often the most important thing for a trip leader to do is to schedule a paddle. Pick a date, set a location and meeting time and let people know that it’s happening. After that many things often take care of themselves – people show up, they get themselves ready to paddle, they get themselves organized and they go. 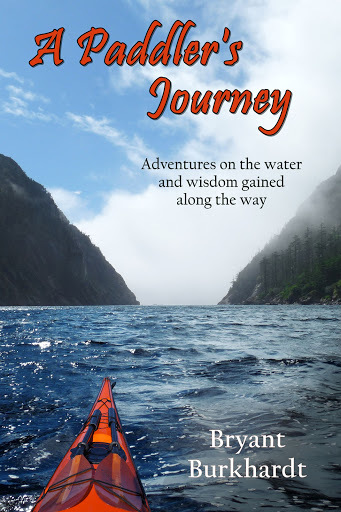 But sometimes people need a little help – they need directions, some info on how challenging the paddle will be, what gear will be necessary, what experience they should have, etc. The more info the trip leader provides up front the easier it will be for people to decide if the trip is for them and what they will need to bring. As a leader, spell out what you will be providing and what you will NOT be providing – will you keep the group together, will everyone paddle at their own pace, will people be responsible for their own navigation, do they need to RSVP, etc. Don’t be afraid to let people know you do not plan on holding their hand as they paddle across the channel – most paddlers are fine with that. As in so many other areas in life the key to a successful relationship between trip leader and trip participant is communication. One question that often arises is whether or not a particular person is qualified for a particular outing. The best way to deal with the question is to allow each person to make their own choice – spell out what the possible conditions will be and what type of skills and experience you feel is necessary for the paddle and then remind them that they are responsible for themselves. If you feel someone is not ready for a trip you need to let them know. On any paddle you certainly have the right to decide who does and who does not get to paddle with you. If the paddle is an advanced one you should be strict on who you allow but if the paddle is in relatively protected waters with many bail out options then there isn’t a need to be that strict. The more inclusive you are the more successful the trip leading will be. After everyone has arrived at the launch site it makes a huge difference if the entire group is brought together and five minutes are spent explaining the plan for the day and reinforcing the ground rules laid out when the trip was scheduled. Review basic safety procedures (and do a quick check to see who has brought what for safety gear); remind people of destinations (for breaks, lunch, takeout, etc); and let them know what your role will be as leader on the water (everyone follows you or everyone’s on their own). It’s also a good idea to do a quick review of communication on the water: paddle signals, radio channels, whatever you will be using. Getting everyone on the same page before you launch is easy and makes the day go much smoother. Once the group is on the water you need to live up to your advanced billing. If you have said that everyone is on their own and you are just going to paddle to your destination then that is fine. But if you have said you will lead people and keep the group together then that is what you need to do. It doesn’t take much work to look after folks but it does take more awareness – you need to actually pay attention to where people are and how they are doing. Is someone lagging behind? Having trouble with the paddling conditions? Are there hazards that you are aware of but someone new to the location might not notice? The easiest way to handle this is to have a friendly conversation with folks and use that time to check in on their status and listen to what they have to say. But realize people often do not ask for help even when they need it – you need to observe as much as listen. One common misperception of leadership is that the leader has to personally handle every situation that comes up themselves. That is simply not true and often not good leadership. A good leader delegates tasks to those who are most capable of performing them – this allows the leader to keep an eye on the big picture and the group as a whole. If someone needs rescuing there are probably several folks who can help out and whoever is closest is probably the best choice. If someone is tired (or sick or injured) and needs a tow then any strong paddler will do. If a paddler has the skill and interest to do a given trip then most likely (though not always) they will have the skills to help others on that trip when something goes wrong. So don’t feel you need to jump in and save the day – let someone else play hero while you sit back and make sure that everyone else is safe and sound. Most serious rescue situations start as minor situations that are not dealt with in a timely manner. To avoid the major incident focus on correcting the minor ones right away. This is where leadership is key – if no one in the group feels responsible then little things get overlooked. If someone drops behind make sure they are OK. If someone looks unstable check in to see if there is an issue – new boat? feeling seasick? overly tense? If it’s a cold day see if people are feeling the effects – anyone shivering? Losing focus? Paddling slower than usual? Many problems can be solved quickly and easily at the start if at least one person in the group is looking out for them. So the next time you’re sitting at home wishing there was a paddling trip scheduled figure out where you would like to go and schedule it yourself. Step up to the task and put the information out to the group and be clear on your role. You will find that it is relatively painless and not only allows you to go paddling but will create many friends thankful for the opportunity to join you. A recap of the situation. 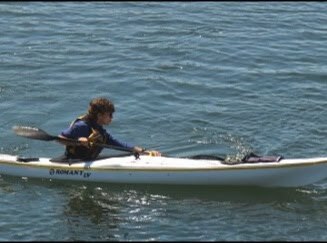 Sean, Pedro and myself set out to paddle to all eight of the Channel Islands off the southern California coast. After doing the first three in three days (and covering over 100 miles) Pedro and I decided that the longer open crossings we had coming up wouldn't be wise. So we went to one more island (Anacapa) on our way back to the mainland. Sean went on to Santa Barbara Island but the winds were not favorable and without the time to wait he headed to Catalina and then the mainland. On his way he had a not so pleasant encounter with a Blue shark (no attack but plenty of circling and harassment for several minutes) and a more pleasant encounter with a megapod of Blue whales. So the goal of paddling to both San Nicolas and San Clemente is yet to be achieved - but it definitely still on the to do list. 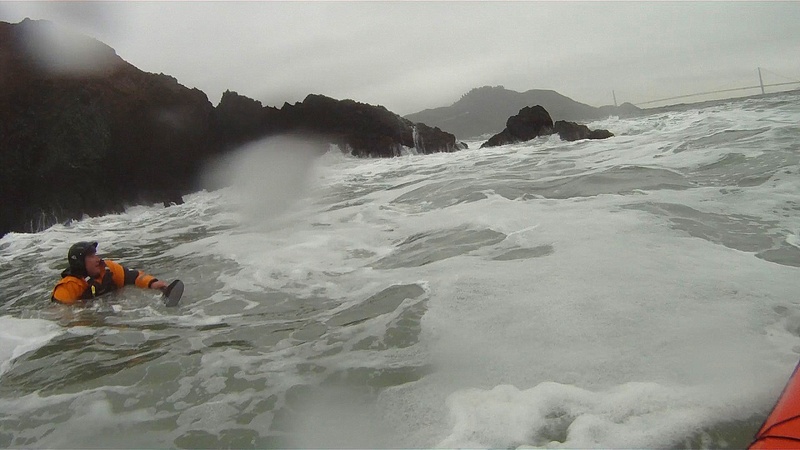 I'm afraid I was interrupted from my Channel Islands video editing by having to teach a whitewater class. But class is over and the editing is done - video is below. For some reason my editing program (Sony Vegas) kept crashing when I tried to render a High Def version but eventually I got it to work. I have to say it might have been a good thing we quit when we did - after doing just four of the eight islands I had hours of video to edit and a really tough time getting it cut down to ten minutes. UPDATE: Sean just txted us from Catalina - too windy out there so he's headed back to the mainland tomorrow. DARN IT! When I first put together the Channel Islands Expedition I rounded up a team of five paddlers. In the planning stages two of the members dropped out for various reasons. So three of us launched from Gaviota last week on the attempt. After three days of paddling it became clear that two of us would not be making the record attempts on San Nicolas or San Clemente Islands so we headed back to the mainland while it was nearby. So now it is just Sean Morley out there on the water attempting to complete a circumnavigation of all eight Channel Islands solo. You can follow his progress on his SPOT page. Personally, while I am disappointed not to complete the trip I feel that it was the smart decision to bail out when we did. Our pace was slower than planned over the first few days and the distances were only getting longer. Pedro was having some trouble with his back and that could have turned into a real nightmare on the big crossings if the weather were to deteriorate and force several hours of hard paddling. And while I felt that I was physically strong enough to make the attempt I was not going to be able to keep up with Sean's pace and if he had to slow down for me it would have been a grueling trip for him - it is essential on such long paddles that each paddler be able to go at their fastest comfortable pace. So I returned home with Pedro having gotten in four days of paddling in a beautiful setting, seeing islands that I hadn't visited in years. And I'm certain I'll be back out there paddling some more and quite possibly make an attempt on visiting all eight islands sometime in the future. But for now join me in wishing Sean all the best of luck - fair weather and fast paddling. I drove down to San Diego yesterday and picked up my boat for the Channel Islands Expedition. Seda is giving me a Glider for the trip and she's a beauty: nineteen feet of speed and storage. I love my Ikkuma as an overall boat but it gets a little tight when packing for two weeks. And I'm also expecting rather mellow seas but long distances to cover - so every tenth of a knot of additional speed makes a difference. I've spent today outfitting the boat so I haven't even had the chance to take it for a test spin. But I have faith that it will float. The last minute shopping is done and my new friend Eric Bloom is shuttling us to Gaviota tonight (a huge favor that is much appreciated). We launch tomorrow morning (unless the forecast changes for the worse) and should be back in 11 days. Wish us luck and keep checking the blog for updates from my SPOT. With my Channel Islands expedition coming up shortly it seemed like a good idea to do some more training. But instead of heading out to the ocean in a long boat I figured trying to make a really short boat go long distances on flat water would make good training as well. So I went down to the Tuolumne river outside Yosemite for the holiday weekend and spent three days on the river getting in some good training. Paddling a six foot boat instead of the nineteen foot speedster I'll be picking up for the expedition was sure to give me a good work out. Truthfully, the weekend wasn't meant to be training but rather a great river trip to get in some whitewater kayaking with lots of old friends from southern California. The main group (fourteen folks total) did two back to back one day trips down the main 'T': eighteen miles of class IV whitewater with plenty of slow stretches and a couple miles of paddling on the reservoir to finish off each day. Many people take two (or three) days to run the river but by doing the whole rive each day we didn't have to carry any gear and we could take play boats instead of creek boats, making the river more fun and challenging. But the trip was much more than just paddling - it was a chance to hang out with good friends in a low stress environment, enjoying not only the water but the scenery, the camping, the dinner in town and the experience as a whole. It was pure fun. The day before the masses arrived some of us decided to run the upper Tuolumne run (known commonly as Cherry Creek since that is where the run starts). This is a class V affair and one of the most consistent and beautiful runs in the state, exceptional in that it has summer releases scheduled so it is still flowing in September when everything else is dried up. Me and Alex had both down the river a couple times but not for years. We lead a group of four first timers stepping up to their first real class V run. It had the potential for epic disaster but everything went quite smoothly. I had to scout more than expected since all the rapids had blurred together in my memory and I got beat down once when probing a hole, but otherwise it was an uneventful day in the best kind of way. Going slow we ended up getting behind the release of water by the time we portaged around the last two big rapids but it didn't really bother us at that point. But it would be nice to get back to Cherry a little more often so I could remember the lines and just have fun bombing the entire run. With my Channel Islands Expedition approaching I went down to the coast for a couple days of training paddles. Day one was a solo trip From Bodega Bay up to Jenner to get some distance in (around 30 miles). Conditions were very mellow so a good representation of what we expect in Southern California. The paddle went well and in addition to the nice scenery of coastline I passed a couple whales playing just outside the breakers on Bodega Head on my way out. They were still there when I returned and had attracted a large crowd on the cliffs above. There seemed to be three or four of them playing just outside the waves - closer in than I wanted to go. But they ended up working their way out and actually came close enough to get a few good pictures. The next day I went out for a shorter paddle with Sean Morley who will be joining me on the expedition. Sean claimed that he hasn't been getting enough paddling in so was a little worried about his fitness. We set off from Horseshoe Cove and crossed over to San Fran under the golden Gate Bridge - ferrying across the ~2 knot flood. Then we headed out along the coast with Sean hugging the shore and playing in the rocks while I chased behind trying to keep up while taking a more direct route. It was still a big effort just to stay close enough to get a few shots of his rock gardening. Of course, as soon as I pulled the camera out I would be losing precious ground so I didn't take as many pictures as I would have liked. I don't think Sean has to worry about his fitness as much and Pedro and I need to worry about keeping up. But then Sean is planning to circumnavigate the islands we are simply visiting so he has further to paddle. I was also testing out my new video camera mount in different position. I ended up getting some interesting footage with the camera facing back at me. It's a pretty standard shot you see a lot in kayak videos that is suppose to show what the paddler is doing and what the conditions are like. It's fairly easy to do since you don't have to try to hold a camera and aim. I've always thought it was a bit of an ego shot - a close up focus on the paddler instead of the paddling. But I have to say after looking at the footage that it actually works pretty well - let me know if you think otherwise. Though I would much rather the camera were pointed at someone else instead of myself. I mentioned in my post a couple weeks ago that our unsuccessful attempt to get to San Nicholas Island in the Channel Islands was chalked up to training for the next time. Well, that next time is coming up fairly soon. I've put together a team to make an attempt to be the first (that we know of) to kayak to all eight of the Channel Islands off southern California. Five of the islands are a National Park, Catalina is another, and the final two - San Nicholas and San Clemente - are owned by the military and you are not allowed to land. I've paddled to six of the islands, my friend Duane Strosaker has paddled to seven - he did a out and back trip to San Clemente Islands solo - but I don't think anyone has made it out to San Nicholas. The team for the trip includes myself and my buddy Pedro, Sean Morley and Helen Wilson; a stellar te am of a Californian paddlers. Duane was suppose to join us but he's decided to focus on his training for the upcoming Greenland competition in Washington. Our route will start on the mainland outside Santa Barbara and cross over to the islands of the park. 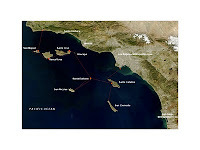 We will make our way back out to Santa Barbara Island and from there make a 60 mile and and back trip to San Nicholas. Then from Catalina make and out and back trip to San Clemente. The whole trip should take about 11 days and average over 30 miles a day (with several over 40). I'll be sending in my location to this blog through my SPOT but you can also check out the expedition website. The trip is set to start on Sep. 10. I taught an ACA Certification course on the local lake over the weekend. It was actually a Coastal cert course and we were able to simulate ocean conditions with Folsom Lake and lots of boat wake from the unknowingly obliging wave-skiers. This was a special class for me in that the four participants were all friends of mine who I not only paddle with regularly but also folks that I've helped to train and mentor in one way or another since moving up to the area three years ago. It's such a rewarding thing to see paddlers develop over time and become accomplished instructors worthy of becoming Certified. And that is what the four of them did - get certified. It's unusual to have a whole class pass the class - the standards are high and I couldn't just lower them for my friends. But everyone involved put in a lot of prep work - getting together to practice strokes, wr iting up lesson plans and giving mock presentations, even recruiting some local paddlers to be students for their practice teaching. That kind of effort put forth by students makes teaching a joy and it also paid off in the final results. So congratulations Neil, Gary, Jeff and Terri! The wind was calm. The whole time. It did briefly manage to stir in the late afternoons but it was with all the energy of uncle Bob rousing from a tryptophan stupor after Thanksgiving dinner to change the channel to the other football game before falling back into the La-Z-Boy. Perfect weather for a paddle. Unfortunately we were hoping to sail. Pedro and I set out in his Feathercraft tandem with a plan to sail out to the Channel Islands and ultimately San Nicholas - an island never visited by kayak as far as we know. We were rigged with a stepped mast, main and jib, and a couple inflatable outriggers to keep us upright. But without wind we ended up paddling, often using only half the paddle as a canoe blade to avoid the sail rig. It made for slow paddling and ultimately changed our plans. 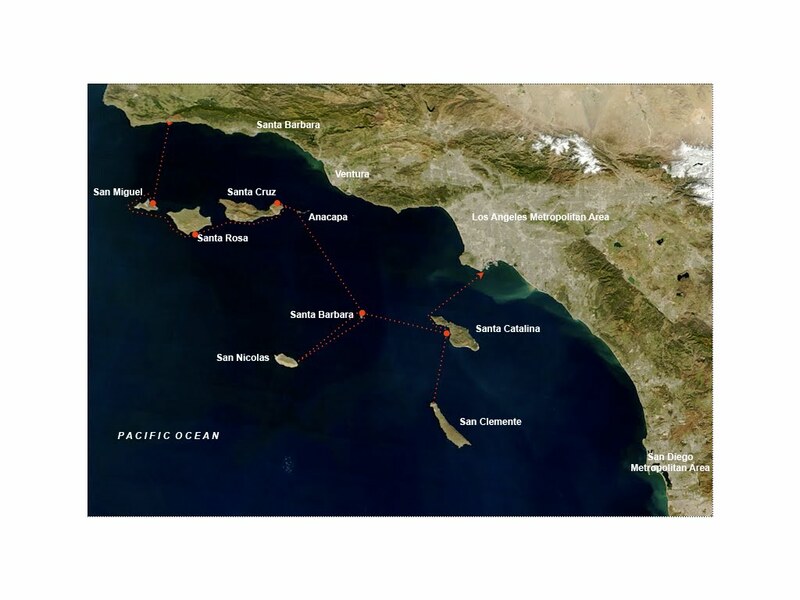 Our planned rout e was to launch in Ventura and head to Santa Cruz Island. Then on to Santa Barbara Island for a night before heading to San Nicholas. Since it is owned by the military (part of the Pacific Missile Test Range) you are not allowed to land so we would just get as close as allowed and then turn and paddle back to SB Island for the night. Then maybe we would swing by Catalina before heading back to the mainland. We made it to Santa Cruz without problem - we were expecting to have to paddle that leg into the wind anyway. And the forecast when we set out for SB Island was promising - 10kt to 20kt from the NW - but the wind never really materialized. So after fifteen hours of paddling we crossed the 46 mil es and arrived in the dark. In the dark at a 20' high dock with a ladder to exit on. While unloading the boat for the big hoist to the top we managed to flood the boat, leading to a marathon pumping session and the loss of a few unimportant items to the dark sea. Getting to sleep around 1am with a similar pattern of wind expected the next day we abandoned our plan for a 55 mile round trip paddle to San Nicholas and settled on a day of rest before heading directly back to the mainland. The paddle back to Marina del Rey went much more smoothly. We took down the sail rig and just planne d to paddle the whole way. This allowed us to make better time and mentally we were fine with the effort. When the winds finally came up around 5pm we took the time to set up the sail and cruise the rest of the way into port (though with the still light winds we didn't actually get there any faster than we would have paddling). So while we didn't quite make our goal we had a good trip and chalked it up to a training paddle for the next attempt at San Nicholas (more on that shortly). Pictures Here and Route Here. In the very large city of Los Angeles there are precious few kayakers and a lack of a robust kayak community. When I was living there years ago a group of us formed a Yahoo! group called Bruinwhitewater (most of us were affiliated with UCLA at the time). It was never a formal club but just a way to try to get together with other paddlers. We would run beginner trips every year to try to increase the number of local kayakers with the more experienced paddlers helping to train the newbies. 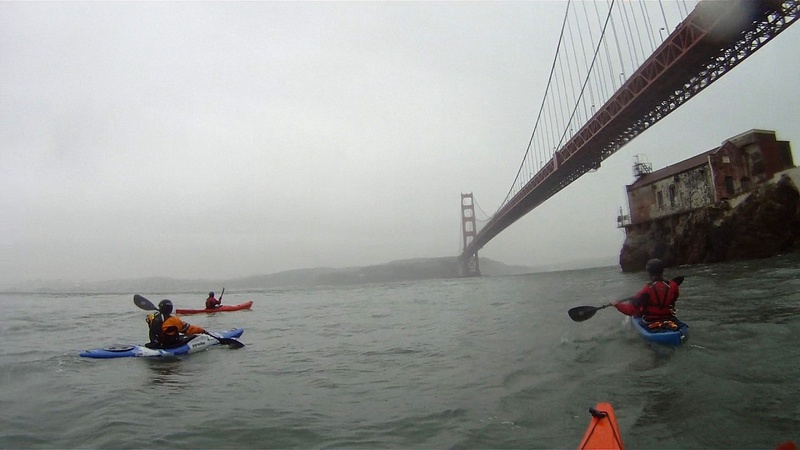 These trips were quite popular and successful and over the years the 'group' has grown and has turned a little more formal as the Los Angeles Kayak Club. No longer an Angelino I still feel I have a vested interest in helping the club grow and I was happy they invited down south to help run a leader training course to get more of the members up to speed on how to train new paddlers and help guide them safely down the river. I drove down to the Kern straight from a week teaching on the Trinity - 12 hours later got me into camp at 4am and ready to go by 9am. The club has some very experienced paddlers and skilled instructors (they are the people who trained me when I started) but they wanted me to bring in my perspective as a working instructor and ACA Instructor Trainer. So we set up a weekend to train six new leaders - people who knew how to paddle but needed to learn how to look after beginners on the water. We started with a review of basic rescue techniques and common teaching methods so everyone would be on the same page. And then the fun began with lots of scenarios, planned and unplanned swims and good debriefs to consolidate the lessons learned. It was a lot of fun and I think the club has a bright future with several new leaders set to introduce a whole new batch of beginners to the sport. Maybe, just maybe, Los Angeles will turn into a boater town yet. Here's some more learnin' for y'all. This is the first in a series of articles I'm working on trying to elucidate how my experiences in one aspect of this sport translate and benefit the other aspects. Again, pictures aren't complete yet but I think you can get the idea. 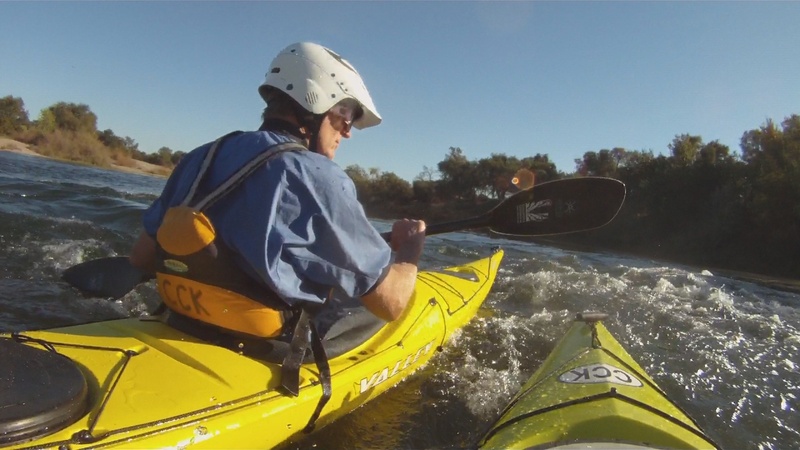 A question I often get asked is which do I prefer – whitewater kayaking or sea kayaking? To me that question is irrelevant, I just like kayaking. The more important question is: what is the difference between them - something that most people do not really understand. I feel that pursuing both types of paddling (and others) provides great benefits in each discipline. 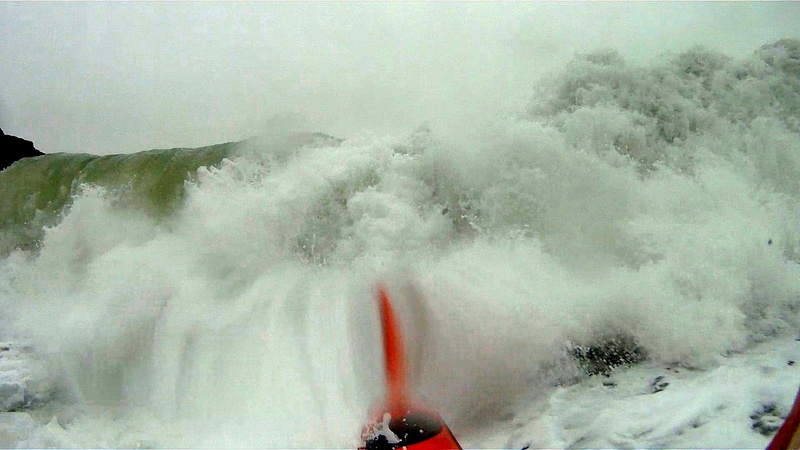 In particular my whitewater paddling has expanded my skill set on the ocean as well as my comfort level. And even if you choose to never set your boat on a river there are many lessons that ocean paddlers can learn and adapt from their freshwater brethren. 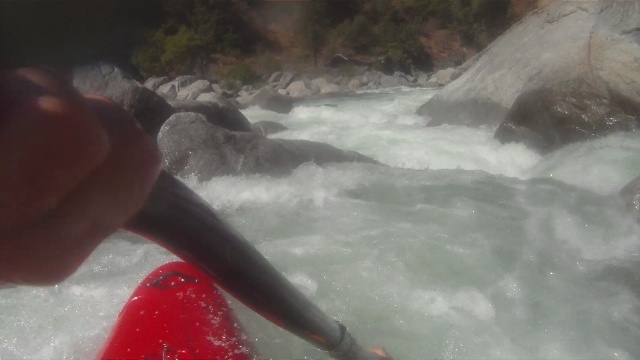 The first lesson, one that I try to pound home in my whitewater students, is that whitewater kayakers are lazy. This, after all, is the great distinction between the sports: sea kayakers have to paddle to get from point A to B whereas river paddlers can do nothing and let the current take them to their destination. In practice it may not work out quite so simply but the mentality will take you far (with little effort). 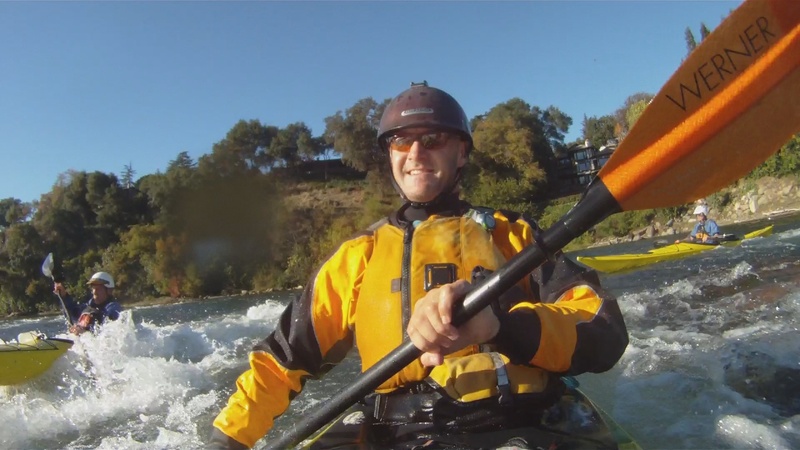 Whitewater kayakers use the minimum amount of work to accomplish their goal. If they can float then they don’t paddle. If there is an obstacle you only need to barely avoid it. If you do need to move your boat, try to use the power of the water and catch a free ride. Let’s take a look at how this can be applied to paddling sea kayaks where there is no current present. Without current you will have to do some paddling to move your boat. But there are still other factors that can assist you unless you are on perfectly flat water with absolutel y no wind. Let’s start with some wave action. Whether you are on ocean swells or a choppy lake waves are simply energy traveling through the water. If you learn to use that energy, or at least to stop fighting it, your effort will be less and your progress easier. 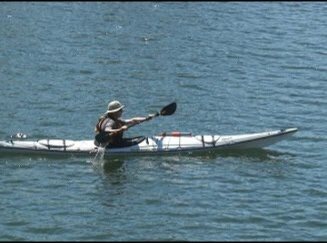 While paddling at a steady pace works well for calm waters it is not the most efficient technique for waves. You need to adjust your timing and output to match what the water is giving you: when your stern is lifted by a wave take a quick stroke or two with a little extra power and you will tap into the wave’s energy and get a much greater return on your investment. If the waves are sizable enough they may carry you right along with little or no work on your part – this allows you to use rudder strokes to keep your line instead of forward strokes to propel you. 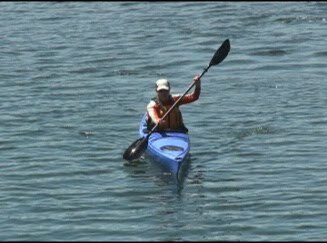 To accomplish this may require some stroke technique that is not commonplace to many sea kayakers. So once again let us look to the whitewater kayaker to pick up some effective technique that uses the water’s energy instead of our own. 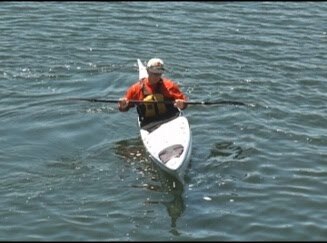 Rudder strokes are a key to paddling downwind/downwave and most kayakers misunderstand this stroke on a conceptual level. Watch a good river paddler surf a wave back and forth and you will see what the rudder is supposed to accomplish: it changes the angle of the bow without slowing the forward speed of the boat. To accomplish this the blade must be parallel to the boat – not out at an angle acting as a brake. The key to the technique is to rotate the torso as far as possible to the side the blade is in the water and keeping the upper hand out over the water. The rear hand can push out (stern pry) to turn the bow towards that side or pull in (stern draw) to turn the bow away. This method of steering your kayak uses minimal energy while letting the energy of the waves propel you forward. But on the other hand, when your bow is lifted by a wave then you are paddling uphill. Any effort you put in at that moment will give you only marginal gain in forward speed. Save your strength and relax and shortly the wave will pass and you can resume your paddling. This is true regardless of wave direction: following seas or head on. Let yourself feel the energy of the ocean and the rise and fall of your boat - try to avoid fighting it but instead tap into it. This means varying both the rate of your stroke and the effort you put forth with each stroke - something that takes practice since most of us develop a steady rate as we first learn to paddle in relatively calm, flat waters. This is why many people feel they can cover less distance on the open ocean than they can in protected waters. But experienced coastal paddlers will often feel the opposite: by following the ocean’s rhythm we can get much farther much faster than we ever could go on our own power alone. As an old sailor once told me: ‘when you dance with the ocean you let her lead’. Now let’s look a little more at paddling in the wind. The obvious advantage is to paddle downwind. You can help this to happen by choosing your course – maybe paddle from point B to point A. Winds typically rise during the day so if you are going out and back then start by paddling into the wind and the stronger winds on your return will outweigh the early headwinds you faced (not to mention it’s nice to have the tailwind at the end of the day when your strength may be lagging). If your course is set and the wind is not conveniently at your tail you can still minimize its effects. I always avoid paddling straight into strong headwinds. Tacking slightly like a sailboat left then right not only minimizes the resistance you face but will ease the motion of the boat through the water. Trying to plow directly up and over wind waves creates a lot of up and down motion of your boat which wastes a lot of your paddling energy. A slight angle will allow to boat to roll a little more gently with the swells and transfer more of your paddling energy into forward progress. When facing a crosswind things can get a little trickier. 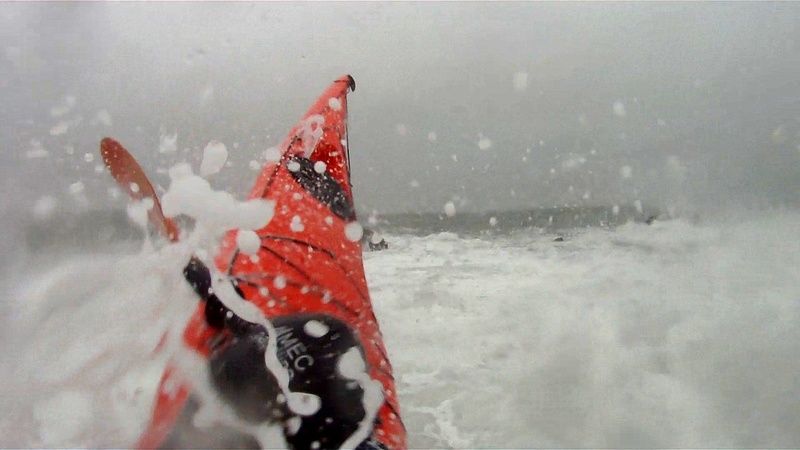 Depending on any additional swell direction it is often easiest to zig-zag once again instead of paddling straight across the wind. Most boats weathercock into the wind and instead of fighting this allow your boat to turn up wind without wasting a lot of energy on sweep strokes to steer. This will result in paddling upwind but don’t take it so far that you are facing a headwind. Before that happens turn your boat downwind and enjoy a ride from both wind and waves. This upwind and downwind combination allows you to focus on forward strokes when paddling upwind and steering strokes when headed downwind with a resulting steady forward progress. Of course for this to be practical you cannot be navigating by compass – you will need visual references (ranges) to make sure you are ultimately heading to the desired location. Be it wind or waves, Nature provides us with a lot of energy. If we learn to use that energy we will be able to paddle further, faster and with less effort. But like many aspects of kayaking this does not always come intuitively. It takes mental effort to figure out how to minimize physical effort. So go ahead and work your gray cells a little and learn how to be lazy like the folks in the little boats on the river – your body will thank you.